Angie in T.O. 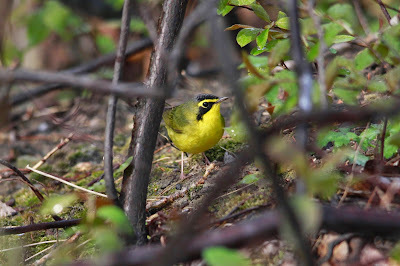 : LIFER ON INTERNATIONAL MIGRATORY BIRD DAY! 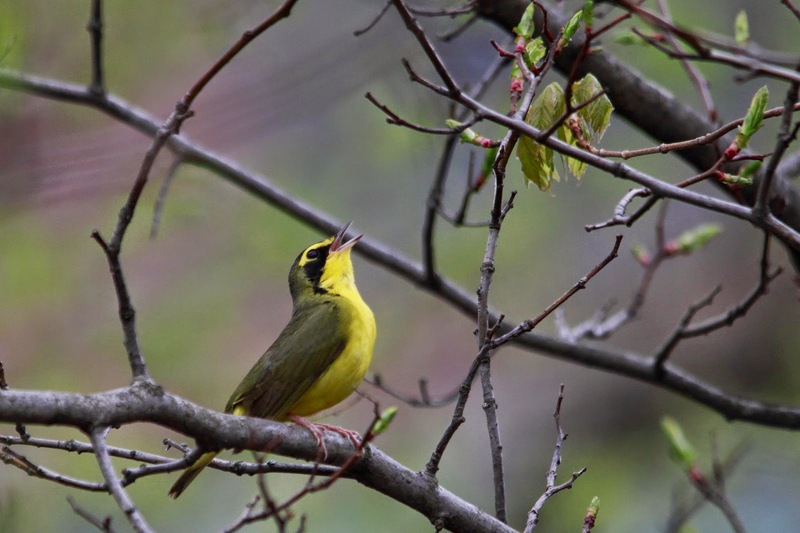 Saturday, May 9th was "International Migratory Bird Day". It was also the first real opportunity Rob and I had to get out and see some of the returning beautiful songbirds that make Ontario their home for a few months of the year. We already knew we were going to hit one of our local parks, Colonel Samuel Smith Park, aka Sam Smith, and we arrived just before 8am. My adrenalin started pumping as soon as I opened the truck door and heard the chorus of many different songbirds. It's always exciting to see the firsts of the season once again. 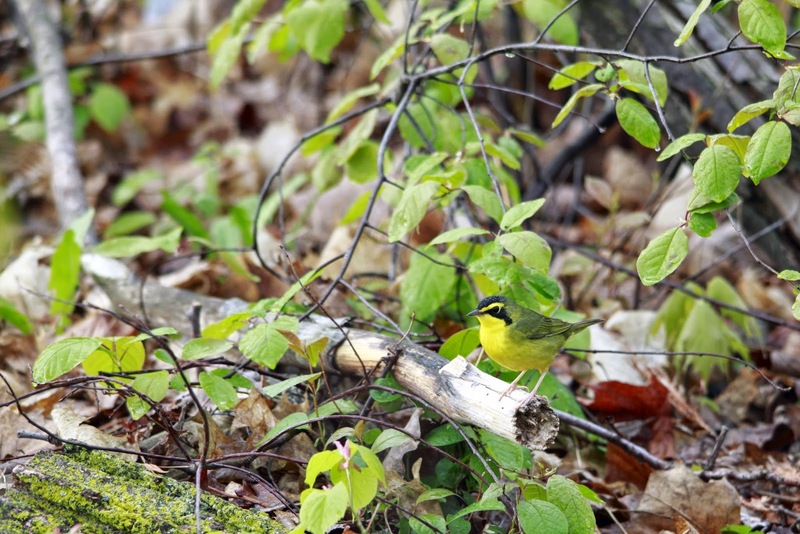 We were having a great morning with many different sightings of birds and people we hadn't seen in almost a year, when a couple let us know that a Kentucky Warbler was on the other side of the field. 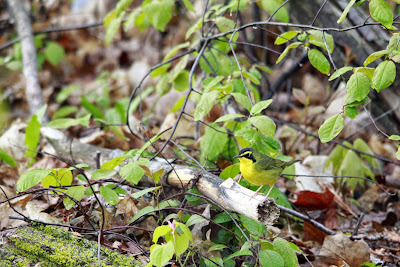 Now, I knew we hadn't seen a Kentucky Warbler before, and it would be a "lifer" (first time seeing a bird) for both of us, but I didn't realize it was a rather rare bird to see in our area. And I didn't realize until later in the day that the fantastic and long view that we did have of it was even more rare. We stood and watched this bird and chatted to people for probably close to an hour while it walked up and down the bank foraging in the leaf bed. The shrubs on the creek bank are not in full bloom yet, so all who made their way to the park to see it were given excellent views. 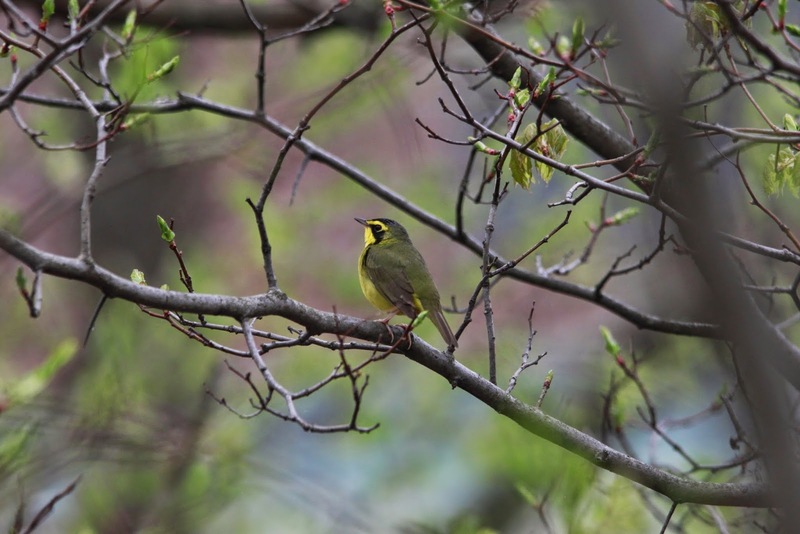 In the little warbler guide I was carrying in my pocket, it referred to this bird as having "Elvis" sideburns. I thought that a great way to describe his markings! 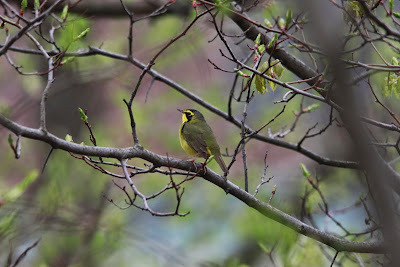 Back to the park we were again Sunday morning, arriving just before 6am, which was planned before the celebrity Kentucky Warbler sighting, and again we saw many firsts of the season, birds and people! 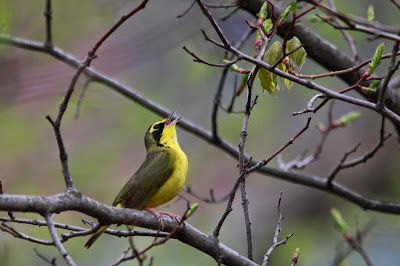 We did make our way to where the warbler was still being seen, and today we just didn't get a great view, but we also got to see and hear him belting out his song! "Ain't nothing but a hound dog, crying all the time....." Sorry, couldn't help myself. When we arrived at the park Sunday, we had expected many more birders to be there when we arrived, but we were only joined by a couple others, but more and more people came to see him as the morning went on. We didn't stay in that area of the park very long on Sunday, but we were both thrilled that we heard him sing, something he wasn't doing the day before. Posing for the many photographers. Who knows how long it will be before we see one of these again. He sure made one of our first real Spring outings of 2015 a memorable one and will probably be the highlight of the season. It's pretty sweet to get a lifer at any time, but having it happen on International Migratory Bird Day made it extra special.